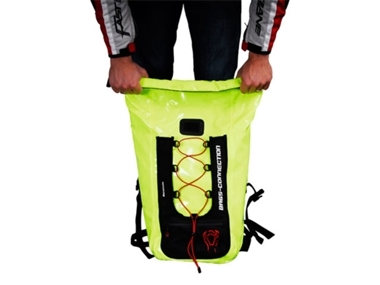 The Backpack Baracuda Motorcycle Backpack 30L from SW-MOTECH is a lightweight, durable, multi-functional, breathable and naturally water resistant back pack made from Neon Yellow welded Tarpaulin. 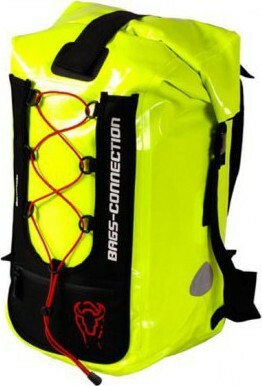 The Backpack Baracuda Motorcycle Backpack 30 L from SW-MOTECH is lightweight, durable, multi-functional, breathable and naturally water resistant. The use of TPU material not only guarantees high wear resistance, elasticity and heat resistance, TPU also protects against the elements. The  ergonomic back provides excellent comfort thanks to the adjustable chest and waist belt. The padded inside pocket of the Baracuda offers room for a laptop, but also separate compartments.On the outside there is another zippered pocket. In a bright Neon Yellow for extra visibility especially at night. Size: 73/38/21 (H x W x D) cm. Adjustable waist and chest straps. Integrated, padded laptop compartment (42.5 cm). Reflective details for safety in road traffic.